FCG Window Cleaning Ltd - window cleaning business covering Leamington Spa, Warwick, Stratford upon Avon, Kenilworth, Solihull, Knowle, Dorridge, Hatton, Henley in Arden and surrounding villages. FCG Window Cleaning Ltd is a well established window cleaning business covering Leamington Spa, Warwick, Stratford upon Avon, Kenilworth, Solihull, Knowle, Dorridge, Hatton, Henley in Arden and surrounding villages. FCG stands for First Class Glass as our emphasis is always on providing quality workmanship and a high level of customer care. This is our aim in both commercial and domestic sectors. We use a combination of Reach and Wash and traditional methods to give complete flexibility in our work and to ensure customers receive the best possible finish. 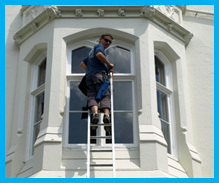 FCG Window Cleaning has been established for a number of years and the Directors and employees have many years window cleaning experience. We have full Public Liability Insurance and have a zero accident safety record. Current safety requirements including Working at Height Regulation 2005 are followed at all times. Our success is built on our reputation for providing a top class service to all of our customers. 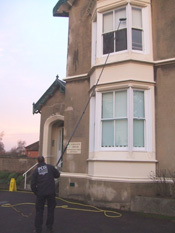 Copyright © 2011 FCG Window Cleaning Ltd. All Rights Reserved.